In 37 minutes the Pistons were +11.4 per 100 possessions with Blake Griffin and Andre Drummond on the floor together. This is particularly impressive when you consider that each game was a blowout. Mitchell gets the shooters roll and the crowd goes nuts! [Lewenberg] Nurse was asked about the team having trouble closing out series in the past. "This team or this organization? Well, this team, lets see if they can start their own history tomorrow." 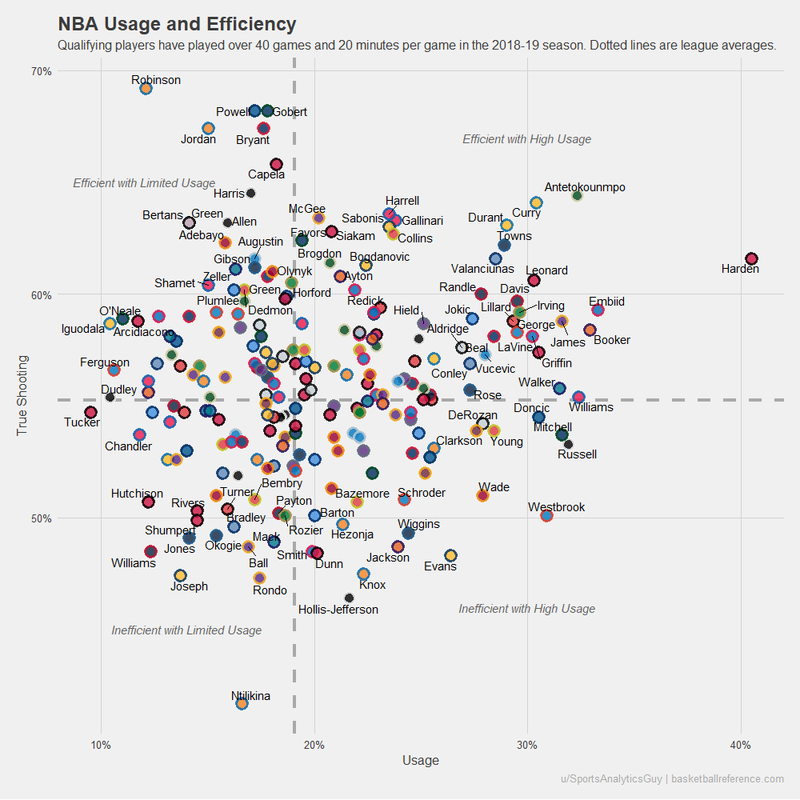 [OC] Which players are the best (and worst) at turning their usage into points? Can we all agree that players complaining to the refs after every single foul is getting really annoying? With a win tonight, CP3 will officially have a winning playoff record. Steph Curry reminding himself not to reach. [Reynolds] USA Basketball announces that Atlanta Hawks coach Lloyd Pierce will assist Gregg Popovich at the FIBA World Cup this summer. Pierce replaces Indiana's Nate McMillan, who has scheduling conflicts. Other assistants: Steve Kerr and Jay Wright. Why does no one talk about Giannis getting superstar calls? The season of hating Russ is upon us. I just thought I would share why I love him. 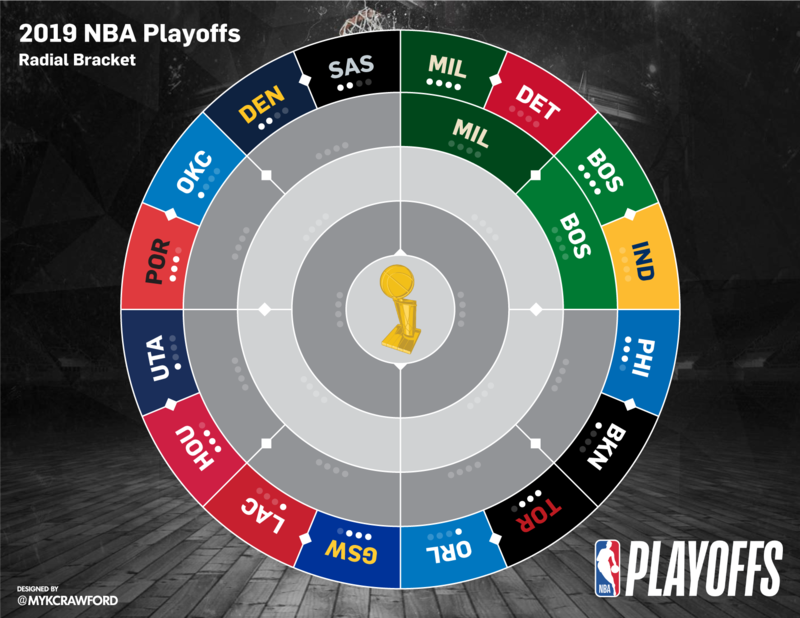 If Dwane Casey loses today, he will have a higher career probability of getting swept in the playoffs (0.400) than winning a single playoff game (0.382). [Tim MacMahon] Rockets center Clint Capela told ESPN he was diagnosed with two viruses (adenovirus and klebsiella) during a doctor visit Sunday. "It's tough, man," said Capela, who was told it will be another four days until he's recovered. "I'm just going to fight it the best that I can." Last year, Lowe reported the Warriors internally think "Westbrook's style of play is easy to defend" and now the Blazers were heard to "just let Westbrook shoot" in the playoffs. Is this a league-wide perception? [Wojnarowski] Phoenix has fired coach Igor Kokoskov, league sources tell ESPN. Steph Curry is 1 of 9 players in NBA history to have multiple championship rings (Steph has 3) and multiples MVPs (Steph has 2). Inside crew reacts to a man eating behind Nick Nurse. Charles - "Them some good nachos down in Orlando, they’re not like them ones in Phoenix"
With their 4-0 sweep of the Pistons, the Milwaukee Bucks have ended the longest active playoff series win drought AND the longest ever playoff series losing streak. [Wojnarowski] Suns had planned to bring Kokoskov back for a second season, especially after the team's stronger play in late stages of the season. Kokoskov has been a well-respected tactician who becomes another victim of the constant turnover in Phoenix. [Charania] First two coaches whom the Phoenix Suns will request permission to interview for head coach opening: Philadelphia assistant Monty Williams and Portland assistant David Vanterpool, league sources tell @TheAthletic @Stadium. [Sam Amick] A statement from Luke Walton's attorney, Mark Baute, regarding sexual assault allegations: "Luke Walton retained me to defend him against these baseless allegations. The accuser is an opportunist, not a victim, & her claim is not credible. We intend to prove this in a courtroom." The Bucks have won their first playoff series since 2001! [Ganguli] Can confirm Kelli Tenant filed a lawsuit accusing former Lakers coach, current Kings coach, Luke Walton of sexually assaulting her while he was an assistant with the Warriors. The Kings declined to comment saying only that they're aware of the report and are gathering information. [Wojnarowski] Here's a factor in the timing of Kokoskov's dismissal: The Suns are planning to target Philadelphia 76ers assistant Monty Williams, league sources tell ESPN. Lakers are planning a second interview with Williams soon, sources said. [Stein] Statement from the Warriors on the allegation against Kings coach (and former Golden State assistant) Luke Walton: "We became aware of the alleged incident and story this evening and are in the process of seeking more information. We’ll have no further comment at this time." Pointing out legitimate flaws in Westbrook's game doesn't mean you're a "hater". Immense respect for Blake Griffin. Reggie Miller is improving as a commentator. If the Blazers beat the Thunder and Donovan gets fired, it will be the third team in a row that has fired their coach after playing the Blazers. The Oklahoma City Thunder haven't won a road playoff game in the 3 years since Kevin Durant left. [Turner] The Lakers have scheduled a second interview with Tyronn Lue on Wednesday in Los Angeles for their head-coaching vacancy. Harden maneuvers around O'Neal, Crowder, AND Ingles and drains the 3!